I've been wanting this guy for two years. I finally got to the renewal period and upgraded. And it came just in the knick of time because my flip phone separated into two pieces yesterday. So, they let me upgrade a few weeks early. Thank you AT&T. I needed a lap top, I needed a GPS, and I needed a new cell phone. 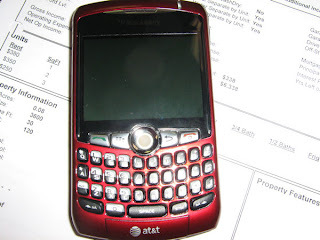 I took care of all three things with this Blackberry. It's saving me a ton. I'd love to tell you about my adventures in knitting and sewing, but then I'd have to kill you. I use my digital camera every day for work... well almost every day. In it's case, it takes up too much space in my purse so it's been laying in there without the case. I noticed that it was getting all scratched up. 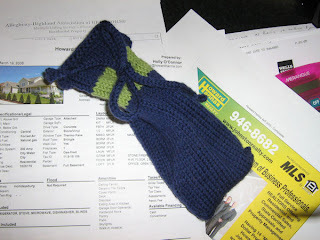 So, over the weekend, I knit up this little bag to keep it in. It works perfectly. If I had it to do over again, I'd make it even shorter. One inch shorter would have been better. It's worsted weight yarn, 42 stitches divided evenly on size 5 DP's. It's all straight knitting except for one row of k5, yo, k2 tog. 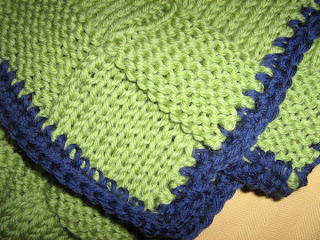 repeat to end in the middle of the green section for the i-cord drawstring. I did the kitchener stitch to close the bottom. Easy and functional. 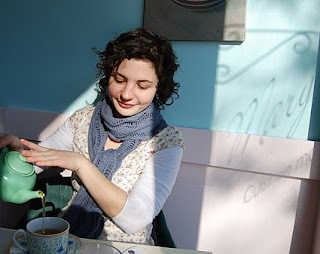 I updated my Ravelry pages a little yesterday. Someday I'm going to get that all figured out and get organized in there. You can find me by searching hollyboc. It's a work in progress. I love St. Patrick's Day. When I was a kid it was a big deal. This year, Easter has thrown a wrench into the celebration. Sorry, but I can't do two holidays in one week! So no corned beef and cabbage for the family today. Maybe in a few weeks. I'm still working on the surprise project but I added this to the mix this weekend out of necessity. I prefer to buy these so I don't have to take the time to knit them, but I just needed it that badly. And I have all sorts of sugar n'cream yarn laying around. I have a million patterns for dish clothes. You can see how in the mood I was to follow a pattern. I say a brain is a terrible thing to waste... on a dish cloth for yourself! 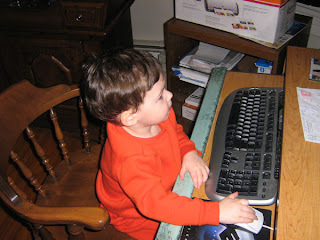 20 months old and he knows exactly how to manipulate the computer already. Kids are amazing these days. It's nice to know that we'll always have someone to come and re-set everything after a power outage. PS... he knows exactly how to manipulate me as well. There wasn't much in this issue that caught my eye, but the more I look at it, the more I like it. However, this is the only pattern I would make. And I will make this. This is the perfect gift. Unusual and pretty. Make this with a great yarn and who wouldn't love it? I also like the Jaden pattern... looking at it, not wearing it. It's cute and would be adorable on some young and thin 20 year old. The green wrap is blocking on Cate's bedroom floor. When I got out the shower this morning I found Irish laying on it waiting for me to come out of the bathroom. Great. Washable wool and Yellow Lab hair. Grrr..... Should have shut the bedroom door! As you can see, I went with the crocheted trim. Why? Lack of patience, that's why. I couldn't get the applied I-cord instructions and I was too impatient to wait for help. I made up the pattern and there are things I would do differently. I would make it a little longer and less wide. 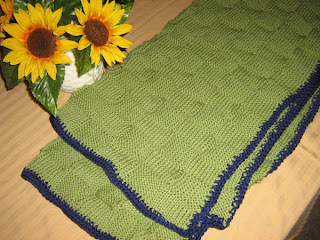 I felt like I had to cut the length short because if I had kept going, it would have looked more like a blanket! 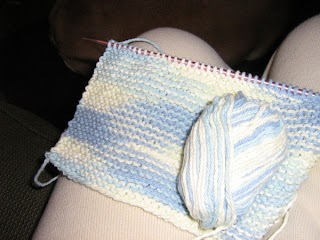 In blocking, I will try to stretch it out a little bit to achieve a longer, less wide appearance. I am working on another really cute project but I can't show it here. It's a surprise! In the blog that I was looking at, it was done in navy blue and it was wrapped around a figure-form. It was gorgeous. I'm not crazy about the yarn in this version, but I love the design. I can see this in off-white wool. A definite future project. And I already have the yarn. Why can't I stop knitting wraps? I bought that dang sewing machine to make Mr. C. a Halloween costume and I haven't looked at it since. It could be time. 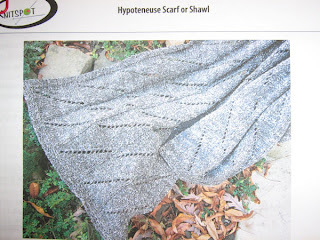 I'm going to finish the three knitting projects I need to get finished and then I'm diving into some sewing. First of all, I can't find clothes that I like in the stores anymore. Everything is this stretchy 70's fabric that I hate. Been there. Done this. Don't want to do it again. What happened to normal clothes? I'm not a big skirt and blouse person. I prefer to wear dresses in the summer or summer slacks. So I guess I'll just make my own dresses if I can't find what I like anymore. 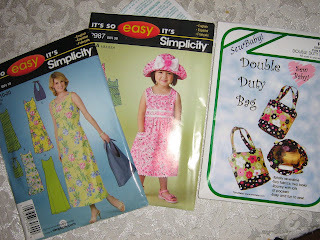 I used to sew a lot when my kids were little. I never anticipated doing it again. But desperate times call for desperate measures!! Well that's not exactly true. There have been things going on, but no knitting news worth speaking about. I'm still just hammering away at the green wrap. It's coming right along. I took it to Monroeville with me for the weekend and put a good many inches on it. I went shopping, DH went to the Golf Expo at the ExpoMart. I considered going to Bonnie's (?) LYS in Monroeville but I quickly talked myself out of that as I need NOTHING. I'm good for projects for about 3 years. Mr. C. locked his mother out of the house this morning and lots of hilarity ensued. Fortunately, he locked the glass storm door and just stood there (with a grin from ear to ear) where she could see him the whole time while she waited for the locksmith to come and rescue him (or her if you think about it). He threatened to shut the solid wood main door a few times but didn't. That would have been a problem. She said she had just come home from the supermarket and McDonalds, and was going out to get the last bag of groceries when he reached up and flipped the latch on the storm door. He had a Happy Meal in the kitchen and she said he made a few french fry runs in the interim but mostly just stayed at the door. Good thing baby # 2 has not arrived yet. Ahh.. the joys of parenthood. He's only 20 months old. The terrible 2's should be fun.